The common European currency tumbled on Monday from its highs due to the triumph of centrist wing Emmanuel Macron. As investor received an estimate of 3% of profit after Macron won a couple of weeks ago. The loss of the populist candidate, Marine Le Pen ended the worries of investors about the radical change subsequent to Brexit and Trump’s election last year in case that Le Pen won. Based on opinion polls, Macron had a consistent point which is roughly 20 percent and his triumph on Sunday was a great surprise. During the early trades of Asia, the euro surge reaching $1.1024 which is its highest rate since November 9. It further increased on its one-year high touching 124.58 yen versus its Japanese peer while hitting a five-month high jumping to 1.0886 against the Swiss franc. However, amid morning session of Europe, it declined by 0.4 percent to $1.0953 vs the greens and 0.6 percent to 123.26 against the yen. The political risk linked with Le Pen were already removed, the risk involves the pledge that France will be taken out from the European region. As the risk was eliminated, the focus turned to the economic fundamentals along with the monetary policy normalization of EU and U.S. The International Monetary Fund issued a regional forecast for India this month and predicted that the South Asian country will slow down because of the cash crunch bring about by the demonetization despite the fact that its economic growth would likely remain strong within the Asia Pacific region compared with the previous outlook in October. According to the report of National Accounts Statistics, the economic impact of the cash insufficiency may be downplayed in the least short term. In addition to it, an analysis made by the staff of IMF states that the projections in October 2016, the negative cash flow seems slow amid the financial year 2016-17 nearly four to five percentage points. While the growth in FY 2017-18 was almost half of its percent point. The Bitcoin attained a record high on Tuesday because of an upsurge demand for crypto-assets and the production of new tokens to increase stake for new establishment through blockchain technology which implies the dispensability of a central regulator. The digital currency rose on the day by 6 percent reaching $1,760.40 from $1,747.89 on the BTC=BTSP BitStamp platform. Currently, it surged to almost 80% percent for the year and a significant expansion of market capitalization up to $52.5 billion, reported by coinmarketcap.com. However, Federal Reserve of Minneapolis Bank President Neel Kashkari is not convinced of a positive bitcoin probable future, saying that the blockchain technology will progress more in the future compared to the digital currency. Also, considering the shift in the market interest where majority of the bitcoin rallied was influenced because of high demand for the initial coin offerings (ICOs). President Trump has fired FBI Director James Comey yesterday in a sudden turn of events in the White House, causing a sudden onslaught of calls for a special prosecutor to take control of the ongoing investigation of the body into Trump’s possible relationships with Russia, particularly during his campaign. This sudden development would most likely lead to a long-term falling out and could cause uncertainties with regards to the fate of the Russian investigations. Prior to Comey’s relieving of his position, the FBI has been involved in the investigation of Trump’s ties with Russia, particularly on whether the Russian government had influenced the presidential elections last year. The Russian government has denied any connections with the current administration. Inflation rate of India narrowed down because of lower food cost for the month of April. However, this would make it tough to ease rates in the near future. Consumer price inflation is anticipated to persist lower than the 4.0 percent medium target of the Reserve bank of India for the past six months. It is forecasted from a survey of economist that inflation in April will decline to a three-month low of 3.40 percent this month compared to the 3.81 in March. Yet, the central bank raised its inflation rate for the fiscal 2017 to 2018 to attain 4.5 percent for the first half and 5.0 the second half of the year. An economist described the situation that even if the interest rate cut exceeded the 4 percent level in the next few months, the RBI will be cautious and would not cut rates since the current situation is stable already. The household debt of Ireland had collapsed for more than 20 times which appeared to be much apace than Europe in 2016, underlining the amount of Ireland’s recovery from the debt-induced financial crisis. Based on the statistics showed by the Irish Central Bank, Sweden ousts the Irish island on the ranking of the most indebted nation in EU as the Swedish region have low-interest rates which gave rise to concerns about the overheating in the housing market of the country. The household credit serves as the disposable income percentage further weakened by 10.2 percent point in the previous year, reaching 140.9 percent versus the 0.5 pp overall downturn in the European Union. The bank also mentioned that the contraction has weighed on the reduction in debt and improvement in the household incomes. The indebtedness has declined by 52.9 percentage point as the year 2012 ends versus with the decreased in the broader EU by 3.3 percent. Moreover, the Irish government was compelled to agree with the Europe and IMF program for economic stabilization in 2010 as the property bubble suddenly broke causing the string of banks to fall down. Despite the strong rebound, the economy remains to become one of the rapid-growing states in EU. The export data of Thailand for first quarter moved at its most rapid “quarterly pace” in the past four years and eases the monetary policy to support low key investment activities. Although it faces uncertainties with capital outflow and global trading protectionism, the U.S. Fed is taking signifying that it is gaining momentum to recovery. The agency reduced its monetary projection from 3.0 - 4.0 percentage to 3.3 - 3.8 percentage economic advancement forecasts while its export progress has been elevated to 3.6 percent from 2.9 percent. The rise in exports is mainly due to steep costs of commodities more than the volume of trades. The central bank retained its key percentage interest rate at 1.50 percent since April 2015 and the upcoming policy review is scheduled on May 24 and expected also kept unchanged. Yet, there is a possibility for the Thai central bank to increase its rates by 25 basis points later in the year because of both sturdy growth statistics and probable augmented U.S. rates. A highly positive retail sales data for the US economy has further reaffirmed speculations that the country’s economic status is regaining its momentum following a previously weak slew of data last winter. However, these positive economic reports were pockmarked by a drop in earnings reports. But economists are saying that the country’s economy could possibly be in for stronger consumer data in the second quarter of 2017, which is apparently not surprising since the US labor market is continuously showing signs of steady improvement. The economy of China further provided below-expected results of its economic indicators as the fixed-asset investment (FAI), manufacturing output and retail sales in the month of April declined. The output of the industrial sector gained 6.5% in the earlier year, compared with the 7% projection of polling analysts of Bloomberg while 7.1% predicted by Reuters. The sales of retail boosted by 10.7% in April from the first quarter of the year. According to forecasts of experts, the rise will reach 10.6% which is lower versus the past period of 10.9% development. Whereas, the growth in private investment that accounts for an approximately 60% of the national sum value, dropped to 6.9% and acquired 7.7% in Q1.This indicates that the small and medium-sized private companies will remain to experience difficulty in finances. The target growth of China is close to 9% allocated for the FAI’s 2017 while there are expectations that the retail sales will surge to 10% generally. The second largest economy in the world had obtained a 6.9% expansion in the first quarter which is the most powerful since 2015. China had lessened its economic objective to give way to the policymakers in boosting reforms and to control financial risks. Brazil’s central bank is interested in implementing regulations to the FinTech sector to provide support for the industry startups and other firms in engaging and improving the Brazilian nation that is currently suffering from a recession. According to Otavio Damaso, the BCB’s Chief of Staff, the advancement of FinTechs and innovative products seems positive for improving the financial system of the country since the economy is experiencing a worst depression. The economy of Brazil got an 8 percent rate in March 2017 which is lower during December 2014. In the past, the country is known to be one of the fastest growing economies around the globe, then political controversies and mismanagement of funds arise creating jobless 13 million individuals. During the former years, the traditional financing options caused banks to charge borrowers higher interest rates, this open doors for many fintechs to influence the Latin America’s biggest economy to offer loans at a cheaper price. The Trump administration has already started the first part of its renegotiations with regards to the North American Free Trade Agreement with Canada. But this first step towards NAFTA adjustments has created a rift between some Republican and Democrat senators, with the backers of the said agreement clashing with dissenters. These negotiations are expected to corner Trump especially now that his political policies are being put at stake by a political crisis within the US economy. Applications for U.S unemployment benefits had fallen circumstantially during the previous week, while the total of jobless Americans declined to a 28-1/2-year low which could lead to a sudden failure on the labor market slack. The economic development was supported by the data released on Thursday that showed an abrupt expansion towards the manufacturing activity within the Mid-Atlantic states this month. The report says that the shipments for goods accelerated and more working hours for laborers. Further measure for the economic activities increase again in the month of April. The positive data favors the expected hike in interest rates for the following month, even if the decision of the Fed Reserve depends on the condition of the financial markets, which recently been shaken by the scandals of US President Donald Trump. Jobless claims benefits were lessened by 4,000 with a seasonal adjustment of 232,000 within the week that finished on May 13 as it experienced a three-weeks consecutive decline, as mentioned by the Labor Department. Economists penciled last week that claims will reach 240,000 but it currently obtained less than 300,000 by which the threshold is linked with a stabilized job market for 115 successive weeks. This is the longest period recorded since the year 1970 which historically appeared that the market was smaller. The employment sector reached full employment with the jobless rate gained a 10-year low to 4.4 percent. The U.S economy was able to produced 211,000 number of jobs in April. The extension of production output cut from big oil producing countries caused the oil prices to rise. Oil future climbed to the highest in almost a month and key benchmarks reaching gains for two weeks. Brent crude LCOc1 increased by 0.5 percent adding 28 cents at $52.79 while the U.S. crude oil CLc1 rose by 0.6 percent equivalent to 29 cents at $49.64 a barrel which is the highest since 26th of April. Investors are optimistic that production will reach an estimated 1.8 million barrels per day by the end of March 2018. OPEC leaders and other oil producing countries will have a policy meeting on May 25 in Vienna. Although, there are signals indicating sufficient supplies from the Saudi Arabia being the biggest oil producer. Investors have mixed sentiment with conflicting concern from the drop in U.S. oil stocks and OPEC oil cuts. Exports from Japan notably increased for five consecutive months indicating a strong offshore demand and increased shipments of semiconductors and steels that boost economic growth. In April, exports climbed up to 7.5 percent compared with the previous year and lower than the median estimate of 7.8 percent yearly growth. On the other hand, its trade surplus with the U.S. also decreased by 4.2 percent from a year ago while the exports jumped by 2.6 percent and continuously grows in the past three months because of high volume of car and auto parts shipments. An economist predicts that this upsurge will continue including domestic imports but the protectionist trade policies of Donald Trump raises concerns with Japan being an export-reliant country. The current Money Fall contest has already started on May 22, 2017 and will end on May 26, 2017. The Supplemental Nutritional Assistance Program or SNAP is currently in peril as Trump’s budget plan could possibly slash over $190 billion from the said food stamp program. These cuts on SNAP will be representing a funding cut of over 29%, since the US government spent over $70 billion on the food stamp program last year. Prior to this particular cut, the Trump administration had recently proclaimed that it will be able to strike a budget balance within a decade without altering the US government’s biggest spending drivers, namely social security and medical assistance. Trump had previously stated that there will be no changes made to these factors during his campaign period. Intercontinental lenders in Greece has a comprehensive meeting discussing debt sustainability on Monday. The meeting ended failing to reach an agreement about additional debt relief for Greece. Ministers disagreed to grant new loans to Athens but the head of Eurogroup, Jeroen Dijsselbloem says otherwise. He said that they are deliberating and making progress on the next disbursement targeting before summer to be able to pay due debts in July. In their next meeting, they are optimistic that they will settle a deal in doling out bailout funds to the country on June 15. They are aiming for a more sustainable agreement which the International Monetary Fund commended and hoping that E.U. governments will support this deal. Although, the deal is not yet ready and will most likely be implemented once the current bailout program has ended next year. Fed officials are now more than ready to raise its short-term interest rates after stating in their meeting last month that increasing its rates are now “more than appropriate”. The central bank also moved to begin cutting back on its Treasury and mortgage securities holdings, which is currently worth $4.5 trillion. The Fed also stated in its minutes that they will be allowing an accumulation of these said securities in the long run without having to reinvest its proceeds to other assets. The Fed’s next policy meeting is scheduled this coming June 13-14 and will be immediately followed by a press conference from Fed Chair Janet Yellen. The credit rating of China was downgraded by Moody’s Investors Service on Wednesday, the previous Aa3 (Double A-3) were down to A1 which means that the Chinese economy is going to grind lower for the next years as the country showed slow growth and its debt continuously increase. The downgrade is done due to the financial pressure that the government faces after years of credit-driven stimulus. Craig Erlam, a Senior Market Analyst of Oanda, said in an interview, “Because talk of Chinese debt and concerns about the size of Chinese debt has been going on for the last few years. They seem to be very reliant on these high levels of growth, which has been slowing.” He further added that the credit downgrade does not surprise him at all. The second largest economy in the world gained 6.7 percent last year and 6.9 in 2015, this pace is the slowest based on the records since 1990 by which Erlam believes that the following years appears to be challenging. The bond credit rating company has expectations that the direct debt burden of China’s government will climb higher reaching 40 percent of 2018’s Gross Domestic Product which is close to the 45 percent as the decade ends. However, it remains lower to the 60 percent for the European Union. The Finance Ministry of the republic claims that the downgrade is based on an improper approach that overestimated the risks on the increasing debt. On Tuesday, the U.S. spending reserved for foreign aid for Mexico and Central America are to be reduced as proposed by the President Donald Trump. The budget was proposed to trim as much as $3.6 trillion government spending in the following ten years for 2018 budget proposal.Although, this may not get a legislative approval as to how it is currently with other departments cuts especially in the State department. Mexican aid worth $87.66 million will be lessened over 45 percent from the 2016 expenditure when Trump's proposal is approved. The budget cut will be transferred to the Mexican military including counterterrorism funds and other government programs. One of the officials commented that these deals are focused on bolstering border security and fight against corruption that may have hindered transnational criminal organizations. There will be a meeting to discuss the employment and security concerns in Central America in June. US President Donald Trump has already called for an investigation regarding the “Manchester leaks” in order for the US government to determine how top-secret information were able to make their way towards the headlines of news reports, when these sets of information were actually only divulged to the key allies of the British government. Several UK officials have already expressed their dismay and disappointment with regards to this particular matter, among them being UK Prime Minister Theresa May. The bombings in Manchester last Monday night had killed a total of 22 people and has left more than 100 people with injuries. The victims were attending a pop concert before the bombings occurred. Oil prices declined by 5 percent following the extension of production cuts by Opec causing other oil producing countries to be dismayed who are expecting a bigger reduction. Consequently, crude prices dropped to the highest percentage drop since early March. During the last OPEC meeting, they reached an agreement to prolong supply cuts constitute of 1.8 million barrels per day until the first quarter ends next year and investors are anticipating around half a million extra barrels to be contracted. However, Saudi Arabia’s energy minister, Khalid Al-Falih said that other ministers find it unnecessary to lessen the output further and nine months is the “optimum” duration. On the other hand, U.S. shale producers are motivated to provide more supplies because of the cheap cost of oil at $50 bpd. Although, they have to be careful since it could exceed the target increase and bring down further the price, stated by the Texas shale oil producer president David Arrington. The economy of India is considered as the fastest developing major economy globally in the previous quarter, induced by positive performance in manufacturing and services. For short-term, the demonetization has affected the demand but was able to recover. The forecast for this year ranged between 6.5 and 7.8 while the actual data achieved a 7.1 percent growth from January to March this year. It has significantly risen from last year’s Q1 growth of 7.9 percent. The upswing in the economic growth was mainly pushed by positive domestic factors taking into account a notable progress of the central bank easing of policy rate into lending rates of financial institutions that made investment appealing to investors. Moreover, the infrastructure spending has substantiated growth and probability for better agricultural output when the monsoon rains become beneficial. On the other hand, the goods and sales tax (GST) is also anticipated to contribute to the economy as its removal will encourage more businesses in India. This will be implemented on July 1st. The current Money Fall contest has already started on May 29, 2017 and will end on June 2, 2017. You can register for the next competition which will take place from June 5, 2017 to June 9, 2017. The US Federal Reserve is more than ready to raise its interest rates this coming June, but the possibility of the Congress rattling up the markets by slowing down progress on increasing the debt ceiling of the US economy has cast a shadow of doubt on the Fed’s next scheduled rate hike on September. Prior to this development, the Fed has been saying that they are currently planning to implement two more rate hikes before the year ends, but has now reverted to saying that the third rate hike for year might be in for some delays if the market gets shaken by possible disagreements on fiscal policies. On Friday, the British pound slumped following vague results without a particular party that dominated that election. Hence, investors are trying to weigh on risks including both events in the United States and Europe. As a result, the cable dropped by 2 percent amid the political problem that could hamper the Brexit talks and cause more uncertainty which will begin in more than a week. Yields on 10-year gilt dropped by 3 basis points to 1.00 percent while the FTSE futures recovered as it gained 0.2 percent bringing hopes up to economic progress. The e-mini futures for the S&P 500 has a lesser impact as it increases by 0.1 percent. The single currency slid overnight following the announcement of ECB forecast to ease inflation but did not talked to tune down the massive bond-buying campaign pushing bond yields to multi-month lows. Its effect in the global investment market can not be defined as it represents just 2.5 percent of world GDP. The current Money Fall contest has already started on June 12, 2017 and will end on June 16, 2017. The European Central Bank decided to loosen its monetary policy on Thursday but indicated that it further needs some support from the central bank amid increasing growth. Mario Draghi, ECB president, is very cautious in his announcement regarding the withdrawal stimulus. During the meeting held on Thursday which is accompanied by 25 members of the council, the bank kept its interest rates and bond-purchase stimulus program steady. The governing council settled small adjustments towards the 19 emerging countries that utilizes the European currency by stating that interest rates could probably move lower. While Draghi issued another significant change as he described that risk to growth is currently “broadly balanced”, the tweak was announced during the April wherein risk are said to "tilted to the downside." Carsten Brzeski, analyst at ING-DiBa, allegorize the bank’s statement to a baby’s first step intended to taper the stimulus effort. The financial institution preserved its bond-buying program at 60 billion euros ($67 billion) each month which will last this year or longer. Moreover, ECB officials were in a stew for the market’s response to the untimely notice that the stimulus will end as the rates will climb higher, undermining the effects. The Bank of Finland forecast data shows the growth of Finland’s economy as exports recuperated gains although it still needed reform to enhance development and stronger public finances. This growth is marked as a big progress following a decade state in hiatus state due to various economic and business problems. The GDP progress is anticipated to improve by 2.1 percent in 2017 which is higher than the former forecast of 1.6 percent in March. In the previous year, the GDP grew by 1.4 percent. Amid the steady growth of exports, the economic growth still depends on the private consumption and investment and will further progress when the employment condition gets better to support an increase in purchasing power. Hence, the center-right government has lessened expenditures and eased labor laws yet the central bank sees the need other strategies to boost the current and future growth. The US Federal Reserve has pushed through with its planned interest rate hike for this month while outlining its plans to continue with stricter monetary policies in spite of the country’s weak inflation rates. FOMC officials approved the central bank’s third rate hike within a six-month period and hinted at possibly another rate hike just before the end of 2017. Fed Chair Janet Yellen stated in a press conference following the announcement that the bank’s plans of unwinding its policies might be implemented sooner than later, especially if the country’s economic status meets the expectations of the Fed. Moreover, the central bank is also looking into a three-quarter point rate increase for 2018 just like its previous projection last March. The New Zealand economy climbed by 0.5 percent in the first quarter of the year but still lower than market expectations as the construction sector weakened. The forecast figure of the central bank is 0.9 percent while the analysts predicted it to attain 0.7 percent, which obviously fell short from both predictions. Despite positive growth for the milk production and a moderate growth of GDP, these were out shadowed by weak data from the construction sector and the mixed results from the service sector. The construction data declined by 2.1 percent for Q1 that negated the 4.3 percent augmentation in agriculture particularly the milk production. An economic analyst described this phenomenon to be transient and the economy will advance at estimated of 3.0 to 3.5 percent this year. Also, other sectors are performing well but there is no need for the Reserve Bank of New Zealand (RBNZ) to adjust its cash rate from a record low of 1.75 percent. The council of Calgary asked to produce an economic development investment fund (EDIF) that accounts to $10 million during on its meeting scheduled on Monday. Based on the Statistics Canada, there were almost 53, 000 jobs lost in Calgary, a region in Alberta, Canada. In other countries like North America, the purpose of EDIF is to create diversification and to work out with the economic downswing. Moreover, the city council released a report regarding the objectives of the said project: (1)Help create the right conditions for growth in the local economy, through efforts to strengthen industries and create new ones; (2) Diversify the local economy; (3) Leverage municipal funds for additional private and public sector investments into the community; (4) Create employment lands and stimulate employment; and (5) Create a return on investment (both direct and indirect). Councillor Richard Pootmans approves the deal for he believes that investments should be administered within the community because no one else will do this favor for the Calgary. Pootmans was recognized having a background in economic development prior entering politics. The 20 percent of the $10-million worth EDIF will be allotted to the 10 cornerstone arts organizations that include the Calgary Folk Music Festival, Theatre Calgary, and The Calgary Philharmonic Orchestra. While the municipal politician would likely consider this idea as he said that, arts is one of the primary factors why people visit their art galleries. The City administrators further stated that art organizations support the high quality of life in the region with an active metro and the economy is well-diversified. The American economy remains optimistic as shown in the All-America Economic Survey by CNBC, along with some leading components reaching its highest level, however, this optimism does not help the president. The poll shows that 800 U.S. citizens or 30 percent of the populace believe that the economy is in upbeat as of this moment until the future. It's the highest percentage recorded in the past two successive quarters amid survey's 10-year history. However, the positive tone of Trump’s economy does not contribute much help towards the approval rating of the state’s leader which showed a 37 percent decline based on the recent survey versus 39 percent result in April. President D. Trump’s approval on the economy is down to 41 percent and 44 percent in April. Moreover, negative factors may arise driven by various groups particularly laborers such as blue collar, independents, and retirees. As the public has split belief, the poll found that quarter of the United States economy is becoming better due to policies adopted by the president. On one side, there are 22 percent who said that his plans worsen the country. According to the most recent poll, Chinese economists have a positive outlook regarding the future of the country’s economy. Forecasts say that the economic growth of China will gain 6.6 percent, this means that aggregate needs of China is extended up to 2034 only in order to take after the United States. The survey was released by the bi-monthly journal, China Economist last June 14 which shows 131 analysis questionnaires. The study is done quarterly conducted by investment banks, research institutions, and widely-known economists. Financial experts that came from the western and central regions of China estimated that the country will expand from 6.63 to 6.6 percent which is higher versus its rivals from the east. While the majority of the analyst believes that manufacturing in China will remain unchanged. The survey further indicates the upbeat tone of Chinese economist regarding the Republic’s better performance driven by the government confidence. There are 35.2 percent of experts that the national debt of the country became much stable rather than of the U.S, considering its debt-to-GDP ratio is almost low and its growth rate in GDP is quite high. Moreover, there are 91.2 percent economists who support the 100-day action plan designed by US President, Donald Trump as they deemed that the American economy can fully recover along with potential revitalization of the manufacturing sector of the state. Federal Reserve authorities are applying more on a hawkish side on the next rate hike signifying less confident prediction for long-term economic growth. The U.S. Treasury yield curve giving a flat yield curve forebodes warning signals on the economy. Buyers will look out for higher yields especially for long-term debts when costs increase. Dallas Fed president said that the cause of the yield curve is the weakened market growth while the New York Fed president described the reason to be the low offshore inflation and borrowing rates instead of a sluggish economic growth. However, the flat yield curve could further ease the current financial condition amid the efforts of Fed to tighten its monetary policies but would benefit riskier assets such as stocks that are not easily affected by the strength of the economy. Nevertheless, the Fed cannot manage the whole monetary base since there are still parts under shadow banking which are larger than what the Fed controls in the present as described by a market strategist. The current Money Fall contest has already started on June 26, 2017 and will end on June 30, 2017. This is in line with the latest data and rhetorics of policy makers who tried to control financial risks to prevent the collapse of the economy which would be discussed on the significant political meeting. The government intervenes with its campaign to control debt risks and steady the financial market since the cash supply was sluggish in the past two decades in May. Notwithstanding, the bank lending remained strong. Companies are starting to sense tighter credit while they presume the deleveraging to be transitory. The Congressional Budget Office stated via its analysis report last Thursday that the US government is in danger of fully depleting its cash reserves as it scrambles to pay all of its bills before October 2017, particularly if the Congress heightens its federal borrowing price ceiling. The CBO also warned that the country’s deficit could balloon up to $693 billion if not addressed properly. Treasury Secretary Mnuchin has long since been appealing to US policymakers to increase the debt limit without any kind of conditions whatsoever before Congress postpones itself for a summer recession starting this coming July 28. Conversely, the US Treasury Department has been utilizing cash conservation procedures in order to cope with the US government’s accountabilities since last March 2017. Two of largest countries in the world, Japan and the European Union is scheduled to make an agreement and sign a free trade deal on July 6, Thursday. As both nations expect for an unfavorable response when the United States deals with protectionism under the Trump administration. It was already confirmed on Tuesday that Japan’s Prime Minister Shinzo Abe will go to Brussels to meet with the leaders of EU institutions. The European Council stated that "Leaders are expected to announce a political agreement on the EU-Japan free trade agreement." This could be considered a brief and final settlement to iron out the entire complications between EU and Japan, the European officials further mentioned on Tuesday that there were still some major issues needed to resolve prior the EU-Japan summit on Thursday. Since Abe already confirmed his attendance, it only indicates his certainty about the agreement and willing to inscribe his signature as well as to put pressure towards trading negotiators in order to ensure partly an outline of the deal regarding the introduction on each other’s markets. And this includes the European farm produce and Japanese automobiles which are considered the most delicate areas. The economy of China could possibly weaken once again in the second quarter of 2017, slowed down by the slight tightening of the monetary policy of the government polled by China economists, Nikkei and Nikkei Quick News. Most of the respondents mentioned that the property market failed to advance unlike before and pointed out that the economic decline will become more evident from July to the end of December. As indicated in the survey, the average estimate of the economists for the gross domestic product of China will rose by 6.8% in Q2 this year, with marginal easing from the expansion on first quarter at 6.9%. The official figures are scheduled to be release on July 17. The current Money Fall contest has already started on July 10, 2017 and will end on July 14, 2017. The business confidence index, associated with workers whose jobs are delicate towards the economic situation of Japan, had increased in June for three months in a row. This is because of the advancement in the retail sale as shown in the government statistics on Monday. The diffusion index of sentiment regarding the present economic conditions which is so-called “economy watchers,” including restaurant employees and taxi drivers, gained 1.4 points from May reaching 50.0, as stated by the Cabinet Office. The administration added that these figures were the highest recorded since December. While the leading economic indicators in the approaching months surged and reached 50.5, higher by 0.9 points. The government was able to maintain its initial assessment for the second time around, claiming that the economy had continuously improved. The economic leaders of the European Union held a meeting on Monday in Brussels, citing that euro countries with huge growth to heighten spending. This is an attempt to convince Germany to step up its public expenditure and to bolster its economic bloc. Germany is anticipated to grow by 1.8 percent this 2017, as indicated in the estimate of the International Monetary Fund, while the trade surplus continued to rise. The stable development of the German economy was linked with the same advancement in government expenditure with a 0.8 percent record on fiscal surplus in 2016. A group of finance ministers was going to discuss at their monthly meeting about the fiscal stance of the EU in 2018 since some urged to influence the budgetary decisions of the 19 EU-member states. The effort of the European Commission to make a slight development on fiscal policy for the entire euro area within this year was fulfilled by the German opposition, however, dropped afterward. Prior the discussion on the 2018 policy, the Economics Commissioner Pierre Moscovici claimed that the logical basis of fiscal stimulus remains despite firm growth in the euro area. The industrial production of Italy had rebounded in May which gives hints that the growth of the economy till the end of the year may result to an equal or could even jump higher to the pace recorded during the first quarter. The production rose by 0.7 percent since April after it dropped on the adjusted 0.5 percent as presented by the Rome-based statistics agency, Istat on Tuesday. While the median estimate of Bloomberg with 21 analysts who answered the survey showed a 0.5 percent increase. The industrial output gained 2.8 percent two months ago according to the yearly and compensation adjustment. The upward revision on GDP during the Q1 in 2017 boosts confidence that the third-biggest economy of the euro area will improve. The manufacturing index surge in an unexpected way during the month of June, hence, the consumers become more optimistic despite the unemployment rate escalated to 11.3 percent shown in the recently released labor-market data. Istat further mentioned in a separate report that their main indicator reflects a “positive outlook for economic activity in the next months”. Moreover, the International Monetary Fund increased its economic outlook for Italy in 2017 which is 1.3 percent versus the earlier forecast of 0.8 percent. The organization added that they anticipate a slight growth of 1 percent from 2018 up to 2020. The economy of Singapore rose for the second quarter as it narrowly missed the recession as the engineering industries remained strong with high demand for semiconductor manufacturing equipment. The economy rose to 0.4 percent in the second quarter compared to the previous quarter and based on seasonally adjusted basis according to the Ministry of Trade and Industry. It dropped to 1.9 percent in Q1 following the first revision in the first quarter and further declined to the former assumption of a 1.3 percent contraction. Despite the median forecast poll in Q2 declined by 1.1 percent, it is still on track to the overall forecast for the city-state progress. The Gross Domestic Product rose 2.5 percent in the second quarter compared last year which was kept the same even after revisions and lower than the 2.8 percent growth. An economist described this as “softer than expected” since the construction has been weak and a slight easing from the manufacturing sector could offset services. At the same time, analysts are skeptical on the country’s sustained growth being electronic dependent and expansion of services may countervail any moderation. One of the top central banks stated that the interest rates of the Reserve Bank of Australia will set to be kept at a record low for some time but some hawks push the currency to drop from a two-year peak. The rate hike was canceled out following the increase of interest rate to 0.75 percent in the previous week according to the deputy governor of Australia. She noted that the RBA doesn’t need to raise their rates when other central banks in the world did which opposes the recovery of the Australian currency after a rise in mining investment for a decade halted. The development of the world economy may be beneficial for the country but it works against the currency. The growth forecast of South Korea for 2017 was changed on Tuesday pledged to maintain an expansionary fiscal policy that would boost employment. The projected data is an expansion of 3 percent which is already the quickest since the 3.3 percent three years ago. The latest was revised was higher from the previous 2.6 percent and the Bank of Korea outlook of 2.8 percent. The rise in global demand of goods supporting growth in the latter six months of the year has progressed which includes fiscal spending worth 11 trillion won ($9.85 billion) as the additional budget on July 22nd. There is high hopes that this would raise growth by 0.2 percent this year as the country’s potential growth rate of 3 percent which seems possible as the government implements reforms towards “consumption-led growth” according to the finance minister. German firms are preparing for a bountiful period on the back of a slackening summer season. Business climate of the Germany boosted for the sixth month in July, claimed by the Ifo Institute. According to the poll, which includes 7,000 companies under the construction, manufacturing and trade sector around Europe’s biggest economy, the index increased to 116.0 which is adjusted from 115.2 last month. This was the highest level recorded for almost 26 years, compared with the Bloomberg’s median estimate showing a decline to 114.9. The euro moved higher following the issued data and continued to trade at $1.1660 at 10:24 a.m. Frankfurt time. Ebullient sentiment shows that the economy of Germany had performed strongly earlier this year and bound to run over until the second half. The continuous decline in unemployment had supported the domestic demand as the Bundesbank projected that the “lively” demand for exports will lead the manufacturing as a major growth driver. Clemens Fuest, Ifo President, said that “Sentiment among German businesses is euphoric”, citing that the German economy will stimulate ahead. Moreover, the country moved at a fast pace in a year during the Q1 while the International Monetary Fund is confident enough towards the nation’s growth outlook after upgrading its forecast for 2018 in the past months. The organization further mentioned that the development for 2017 is 1.8 percent and 1.6 percent in 2018, bolstered by the strong domestic demand and stabilized international trade. The Ifo gauges the present economic situation will gain 125.4 from the adjusted 124.2 and the measures of confidence will expand to 107.3 from 106.8. The GDP figures for the month of April to June is going to release on August 15. 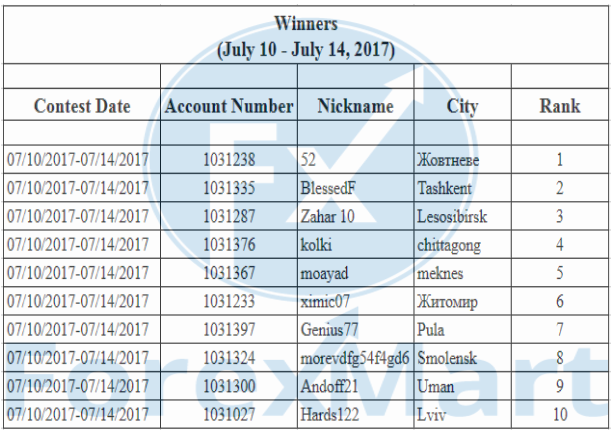 Winners for the week July 10 to July 14, 2017.